To receive a message when we take local orders for unbleached flour, sign up for our emails. 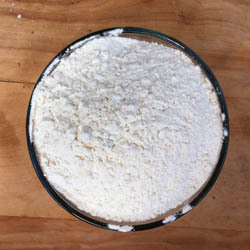 What is Natural White Flour Good For? Natural white flour and organic bread flour, are basically the same product, but the Natural White is certified chemical free rather than organic. Both are unbleached, and both have had the germ and the bran removed from the whole grain wheat. These flours are enriched with B-vitamins, niacin and iron and have both had a small amount of malted barley flour added to further enhance final product consistency. Wheat Montana’s unbleached white flours are made from a blend of hard red wheat and hard white wheat, so they are high in protein and especially suited for bread making. However, our family uses Natural White flour for pie crusts and other pastry-type baked goods with very good results. We love Wheat Montana products because they are NON-GMO (non-genetically modified) and also Certified Chemical Free. Certified Chemical Free grains have been produced in a chemical free environment. However, unlike Wheat Montana’s organic products, these chemical free grains are grown using a natural nitrogen fertilizer. An independent lab tests the harvested grain for any chemical residues, and finding none, they certify the grain as chemical free. These grains are also very clean, not that it matters when you’re buying flour, but it’s super important if you’re milling your own flour since a small stone in the wheat could easily ruin your grain mill. How much wheat should I buy? Copyright © 2009-2015 Bulk Natural Foods. All Rights Reserved.